The designs in this coloring book are of horses in many different scenarios. There are horses running free, horses with their female owners, racing horses and a good number of designs based on cowboys and the wild west. The designs are lovely and detailed with elaborate settings as well as beautifully drawn horses. The designs are extremely detailed and have many intricate and small areas to color. There is a lot of shading by way of delicate crosshatch (lines) rather than a heavy use of black. Because of the intricacy of most designs, I don’t recommend this book for anyone with fine motor or vision issues. I didn’t realize when I starting reading this book that it was the latest in a long series of Savannah Reid mysteries. 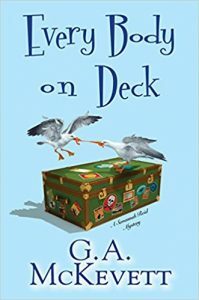 It was the first one that I read and I found it both fun and an engaging mystery. I have since found out that Savannah is a plus-size detective. While the book mentions her curves and her enjoyment of food, it doesn’t stress her size at all. There is a group of individuals who make up the detective agency as well as Savannah’s husband, Dirk, who is a police detective and who was Savannah’s partner in prior years. 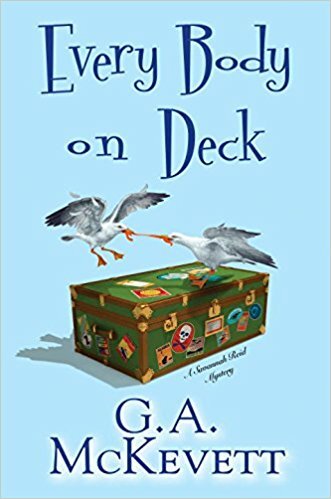 Each of the characters has a distinct personality and apart from Savannah (who is quite sassy), my favorite is her Granny. This is the second book in a series of dragon designs by Rachael Mayo. 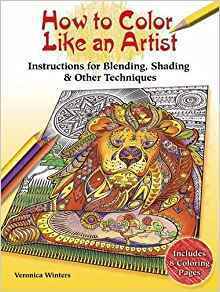 It is my first and I will certainly be picking up her earlier coloring book now that I have seen both the imaginative drawing and the quality of her work. There are dragons in many poses. Most are of a single dragon but there are designs which include other dragons and other fantasy creatures. The dragons are set on backgrounds which range from simple to detailed. It is a great all-around coloring book for those who enjoy dragons and fantasy subject matter. The designs do not merge into the binding area. There is a framing line at the outer edges of all four sides of the design. The designs in this coloring book remind me of the years that I spent living in a small desert town. There is an abundance of unusual animals and plants which are beautiful in their stark surroundings. For instance, when one thinks of cactus, the first thought is of the dangerous spikes that cover them. Having lived around them, I always think of their beautiful and colorful flowers which stand out against the desert setting. The book has wonderful drawings of cactus with flowers and without. There are also many animals, including wolves, owls, birds of all sorts, lizards, jack rabbits and more. The designs range from open and flowing to more detailed ones with intricate parts to color. While most of the animals are represented more realistically than not, there are a few which have doodle elements within their outlines. It makes for a nice change of pace in the coloring book. I use a blotter page below my working page when using these wet mediums. It keeps the ink from seeping through. You can also remove pages before coloring to keep the rest of the book from being damaged. Gel pens leave a slight shadow on the back of the page but do not bleed through. Some pens require additional drying time. Colored pencils work well with this slightly rough paper. I was able to get good pigment with light layers. I was also able to layer multiple colors well and blend easily with a pencil style blending stick. I tested both oil and wax based pencils with equally good results. This is a coloring book packed with more than 80 dinosaurs featured in designs. There is a heavy use of black for shading on most of the designs. The dinosaurs are part of a design which includes the background it is not just the dinosaur by itself. Each of the designs has a framing line at the outer edges. The designs are detailed and intricate and small areas to color. The dinosaurs in the designs range from very realistic to slightly cartoon-like in nature. At the back of the book, there is an index of sorts which provides details about some of the dinosaurs. It provides the name and other information including, in some cases, where a specimen has been found. This is what I found while coloring in this book and testing it with my coloring medium. Paper is medium weight, white, somewhat smooth, and non-perforated. Sewn binding which can easily be snipped to remove a number of pages at a time. The designs do not merge into the binding area and have a framing line at their outer edges. Colored pencils work okay with the paper. I was able to blend, layer the same and multiple colors using both oil and wax-based pencils. Blending was done better with wet blending medium versus a pencil style blending stick as the stick had a tendency to smear rather than blend the colors. The designs themselves are quite detailed. Some of the designs have a heavier use of crosshatch shading than the majority of the designs. Most of the designs contain intricate spots to color which might require very small nib pens/markers or extremely sharp pencils. Because of that, it might not be for those who have fine motor or vision issues. This is what I saw while coloring in this book and testing the paper with my coloring medium. Paper is the usual Creative Haven quality: white, medium weight, slightly smooth and has perforated pages. I’ve noticed that some Creative Haven books have slightly rougher paper than others. This is one of the ones that is slightly more smooth. Coloring pencils work well with this paper. I was able to get good color, layer the same color and multiple colors and blend easily using a pencil style blender. I tested both oil and wax-based pencils with similar results. Hard lead pencils, like Verithins, leave dents on the back of the page. 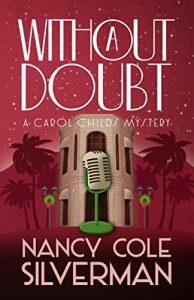 This is a fast-paced mystery in a series about Carol Childs. Carol is the news reporter for the now chick-lite radio station KCHC Talk Radio. Carol is chaffing at the bit because of the new format which has her reporting on fluff instead of hard news. She, and her excellent friend Sherri, are doing a taste-test competition for charity which features various famous chocolatiers in Beverly Hills (about as hard hitting as her news stories are these days.) 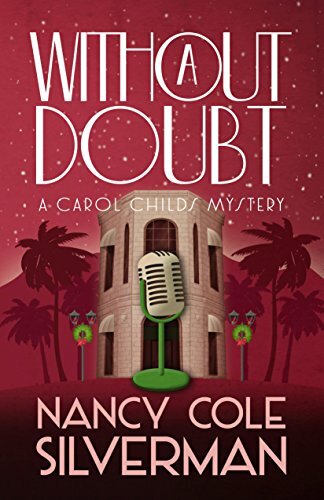 Things are going sweet until, right in front of them, a personal bomb goes off in Carol’s life shortly followed by an actual bomb going off at the prestigious Westin’s jewelry store. This is a lovely book of designs based on the Edo period of Japanese history and Ukiyo-e artwork (1615 through 1868.) Each of the designs in the book has the information about the original artist (from whose woodblock prints the line drawings in this book are derived.) It gives the name, date and information about what the design represents. The designs are detailed and some have intricate and small areas to color. Many of my coloring books by Ming-Ju Sun are in the Creative Haven line. This book is older and is currently out of print. It was released as a standard Dover Coloring book. The difference is distinctive as this book is printed on both sides of the page, has a slightly different feel to the paper, and is not perforated. 30 Japanese art inspired designs based on the Edo period of Ukiyo-e artwork. All designs have a framing line around the outer edge to give a natural stopping point for the design and all of the elements within it. I really appreciate this feature in coloring books. This is the latest coloring book release based on Marvel comics. The designs in this book are based on the characters of Guardians of the Galaxy comics. As with other coloring books in this series, the designs are printed on one side and the pages are perforated. Also, unlike other comic book coloring books (which are merely black and white versions of actual comics), there are no words printed on these pages. I really like all of the Color Your Own books and this one especially. The characters are the ones that I wanted to see and will be happy to color.